In this unit you will learn two fretted notes on the fifth string, the repeat, first & second endings and a variety of common ornaments. ‘B’ is directly underneath the first leger line below the staff. To play ‘B’, fret the second fret on the fifth string. ‘C’ is on the first ledger line below the staff. 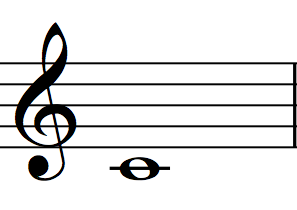 To play ‘C’, fret the third fret on the fifth string. 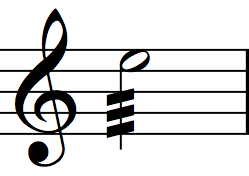 The repeat sign is comprised of two vertical lines and two dots. Notice how the dots of the two repeats face one another. When the dots of two repeat signs face one another, all the music in between them must be repeated. 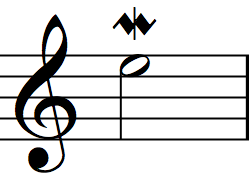 If the score has one repeat sign alone, you are expected to play from the beginning to the repeat sign then jump back to the beginning and play the same musical material again. When you encounter the repeat sign a second time, ignore it and continue playing through the score. 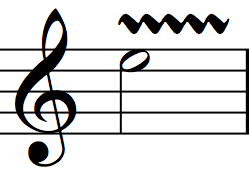 Often, repeated sections of music will feature a first & second ending (AKA prima & seconda volta). 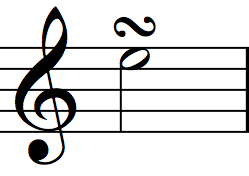 The first ending consists of the measure(s) under the line labeled ‘1.’ Similarly, the second ending is the measure(s) under the line labeled ‘2.’ The first time through the music, play the first ending. The second time through, skip the first ending and jump directly to the second ending. The vibrato is a jagged line. It directs you to produce a rapid and slight variation of pitch. The upper mordent is a short, horizontal squiggle. It directs you to produce a quick, single alternation between the indicated note, the note above it in the scale and the indicated note again. The lower mordent is a short, horizontal squiggle bisected by a vertical line. It directs you to produce a quick, single alternation between the indicated note, the note below it in the scale and the indicated note again. The trill is a long, squiggly line. Sometimes it is simply the letters ‘tr.’ It directs you to rapidly alternate between two adjacent notes for the duration of the notated rhythm. 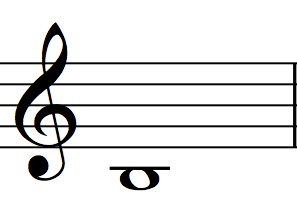 The turn looks like a horizontal ‘S.’ It directs you to play four notes: the note above the indicated note in the scale, the note indicated, the note below the indicated note in the scale and the note indicated again. The tremolo consists of slashes through a note stem. It directs you to rapidly repeat the notated pitch. A variety of guitar techniques can produce a tremolo. 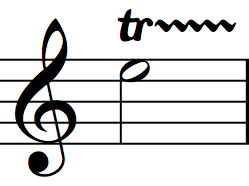 The most common tremolo consists of three slashes through the stem. 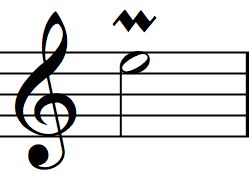 However, some notation employs more slashes for a faster tremolo (or longer duration) and fewer slashes for a slower tremolo (or shorter duration). Mentally scan the score before playing. Quickly pass your eyes along the score—from left to right—making sure you understand the feel created by the meter and tempo. You can envision a scenario or adjust the rate of your breathing to prepare your mind and body to match the feel of the piece. I know a guitarist who visualizes herself on a surfboard in the Pacific Ocean, eager to catch the perfect wave. When a piece requires a lot of energy and rhythmic intensity, I sometimes imagine a train propelling onwards. If you have time, quickly scan the score again. Look for any recurring or unusual rhythmic patterns, articulations or ornaments. Make the quick-scan a habit. It will help you to expect the unexpected. You will notice that the following scores no longer contain advice about proper counting. At this point in your sight-reading development, you must be able to determine the proper way to count. When you do the quick-scan, as discussed in the Sight-Reading Tip above, decide how to count based on the composition’s smallest rhythmic unit and meter. For example, if the smallest rhythmic unit in a common-time piece is an eighth note, then I suggest you count: 1&2&3&4&. However, if the smallest rhythmic unit in a common-time piece is a quarter note, then you can simply count: 1234.